Your kitchen is full of old appliances that don't work. You're up to your head in electric bills because of these older products. A 24-inch double wall oven is a possible remedy to your worries. Energy efficiency, durability, ease of operation, and an elegant finish are some of the perks of owning these ovens. It's not just the energy savings that makes newer appliances worth the upgrade. The features of baking, broiling, and preparing meals in these appliances reinvents dinner prep at home. Even if you're not an avid cook, you're going to become one with top-of-the-line appliances. When reviewing the best 24-inch double wall ovens, we looked at many factors. We first compared electric vs. gas models. In our review, we also examined several top manufacturer brands to rate the best ovens. We included customer reviews of these products to provide consumers a better idea of what to expect from each product. Of course, we also considered the price point and feature list of each model. 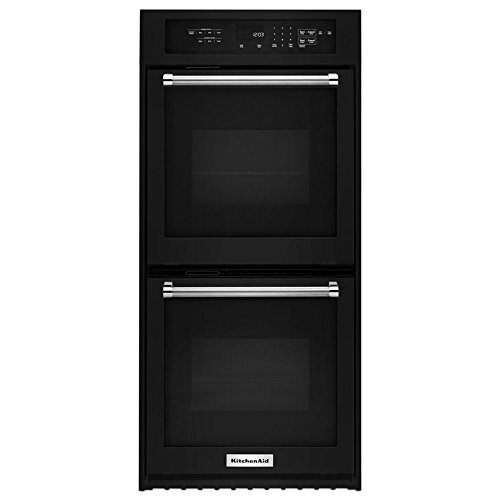 The black GE double wall oven features a self-clean function for the top oven area. The electronic touchpads make it easy to operate. It features a transparent window on both oven doors, so owners can easily peek in on their dishes. The oven's interior illuminates while running and it features a control lock function for safety. The electric fuel type is energy efficient, so it will help reduce monthly energy consumption. The top oven also features a timing control for simple meal prep also. The simple design and smooth control functions make this oven a great product for any cook, regardless of experience. And, GE is a reputable brand. Consumers can rely on the quality. The oven does not feature a convection cook function. One reviewer claims that the dimensions for the oven do not match those on the GE website. So, it did not fit properly into their kitchen space when installing the new wall unit. The average ratings are 3.5 out of 5-stars on Amazon. The Kitchen Aide electric oven features true convection cooking. The airflow helps circulate higher temperatures and reduces meal prep and cook times. The EASYCONVECT system takes the guesswork out of cooking meals at home.This feature automatically calculates the proper cook times, so owners don't have to set countdown timers anymore. The even-heat preheating also ensures dishes are the perfect temperature and consistency while cooking. The oven is available in black, stainless steel, and white. The electric controls are easy to operate, and a control lock helps prevent accidents or injuries in the kitchen. It also features a self-cleaning cycle for both top and bottom oven compartments. Reviewers indicate the oven is loud while operating. 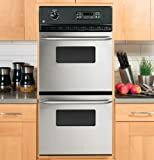 One reviewer also states after about one month the lower oven completely shut off and doesn't function.Quality concerns are a possibility according to some reviews. 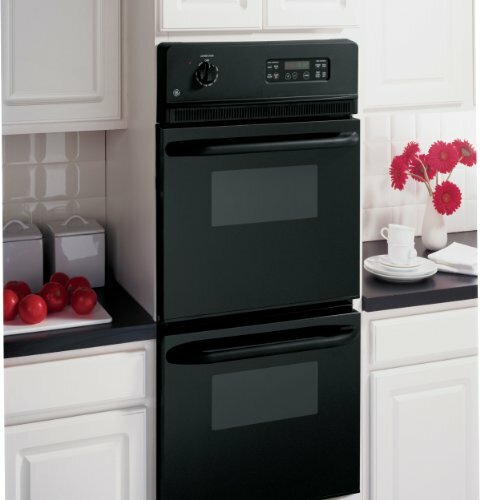 This user-friendly oven features 3.3 cubic feet of preparation space in each of the two ovens. The racks feature heavy-duty handles, and the top oven has a broiler function. A large viewing window allows owners to see foods as they're cooking in the ovens easily. The upper oven features a self-cleaning function. The fan is quiet while operating, so it's barely noticeable when preparing dinner. A warming zone also helps keep foods warm, if one of the two ovens finishes first. ​One reviewer notes that the size of the oven wasn't accurate with the product dimension listings. So, customers should make sure it will fit into their kitchen before purchasing. The double wall oven is available in black, white, and stainless steel varieties. Owners can purchase an additional three or five-year warranty on this oven also. There is a 12-hour delay start function. This feature allows owners to set it before leaving home, and dinner is ready when they arrive. It features a self-cleaning mode and a 3.1 cubic foot capacity in both ovens. It comes with four oven racks, two in each section, and up to 10 guide positions. A warming function keeps side dishes warm if one oven is still cooking a dinner course. It also features a control lock system. One reviewer indicates the oven is extremely noisy while it is operating. Another reviewer also states that the temperature ratings aren't accurate on this model. So, these are a couple of areas of concern to consider, for those who are considering this oven model. This GE oven features electric oven control panels. It also features a clear view window allowing owners to check on dishes as they're preparing them. It has an interior oven light that lights up while cooking. There are two oven racks, and several oven rack positions to fit larger or smaller items in the oven. There is a self-clean feature for the lower oven and variable delay-cleaning feature for the upper oven. It features audible preheat settings, a clock display light, and a cooking timer. A certified Sabbath mode allows owners to prepare meals without having to touch appliances on the Sabbath. The oven also has a control lock. Consumers complain about the dimensions on the website is inaccurate. Some reviews indicate they incurred additional costs to have their wall space opened to install the oven. 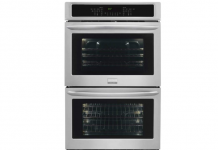 This double gas oven features a 4.7 cubic foot capacity and convection cooking. It also features an instagrill broiler system. The porcelain interior finish is durable and can withstand high temperatures. The gas oven features commercial-grade finishes and delivers the highest levels of efficiency in any kitchen. The French-door design makes it easier to access foods in the oven. With convection capabilities, the product uses less gas than competitor models. 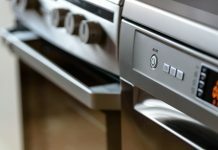 That means it will require less energy and reduce gas bills in the home.​"Green" technologies also reduce energy needs making this a highly efficient double oven. The all-stainless steel exterior is elegant and blends in well with any decor. Simple turn-dial knobs allow owners to quickly change temperature settings for each level while preparing a meal. The product is available as a refurbished model. Consumers must consider that this will likely void warranties from the manufacturer. The oven features European convection settings in the upper oven to speed up the cooking process. It also has a unique baking rack and a broil element to enhance the cooking experience. Touch-glass controls are easy to set, and self-cleaning functions make cleanup a breeze with this product. 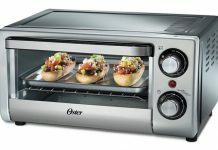 The oven features 10-pass bake heat elements and eight-pass broil elements. A halogen interior light allows owners to see foods while they're preparing them efficiently. The self-cleaning function is available for heavy-duty racks in this oven also. One reviewer indicates they began receiving an error message on the oven indicating a component needs replacement. After only two-weeks, owners shouldn't expect this of a brand new appliance. Owning a 24-inch double wall oven will make it easier to cook at home. 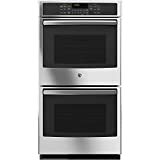 These ovens feature two individual ovens, meaning owners can prepare two different dishes at once. Owners can set varying temperatures without affecting the dishes in the other oven. It will reduce meal prep time, streamline your kitchen, and increase flexibility for at-home chefs who love cooking. Several features set a 24-inch double wall oven apart from a stand-alone oven or older appliances. These are a few of the many features consumers should look for when deciding on new devices. As the name implies, it features two ovens, rather than just one. This feature reduces prep time and allows owners to make many dishes at once. Owners can bake or roast many items. With double ovens, they can prepare meals at different temperatures at the same time. This feature ensures they aren't going to overcook or undercook the foods they're making. A control lock is a great feature to keep the kids away (or adults) while the ovens are operating. It's a great feature to help prevent injuries in the kitchen. It also disables others from disabling the appliance while it's running. With older ovens, people sometimes waited 12 hours, or longer, for the self-cleaning function to work. With a new 24-inch double wall oven, this isn't the case. Many efficient models self-clean in less than one hour. And, there's no longer the unpleasant odor and noxious gases that old ovens emit when self-cleaning. Electronic dials are present on most 24-inch double wall oven models. This feature allows owners to quickly set the right temperature for every meal they're preparing. It also allows them to set timers to automatically shut the oven off once it reaches the set temperatures. Some ovens feature a variable broil option, reaching temperatures of 500 degrees Fahrenheit or higher. If foods need faster/slower cook times, owners can easily adjust the variable dial when preparing those dishes. Convection fans are also present on some higher-end models. These fans help circulate air and reduce cooking times. There are two main types when choosing a 24-inch double wall oven: gas models and electric models. Each comes with various options. With this option, operating cost will depend on the owner's monthly gas bill. Some models feature electric control knobs allowing owners to modify temperature and cook time settings. There are fewer options available in comparison to electric ovens. These ovens are typically cheaper than electric, but also have fewer features built-in. 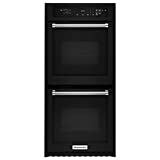 Electric wall ovens are also available in single and double-oven varieties. These ovens have a larger capacity than gas ovens and more user-friendly features. Cost of electricity will determine monthly bills for operating it. There are also electric convection oven models, which isn't very common in gas ovens. This option helps circulate hot air to reduce cook times. 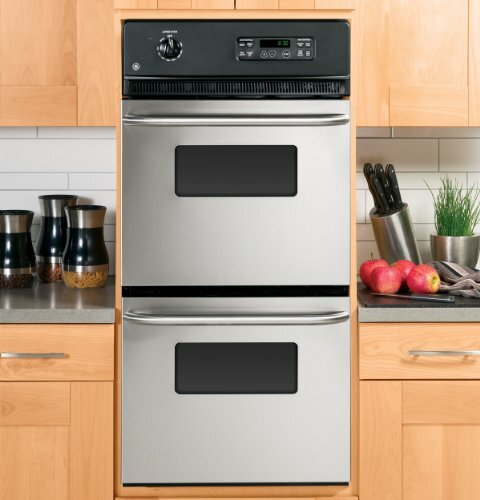 When comparing the best 24-inch double wall oven models, there are many to consider. Depending on whether you have electric or gas power in your home, the model you choose will vary. It's a good idea to compare several models to find an oven that has the best features. Of course, pricing is also essential. So comparing a few products allows you to select the best product within your budget. 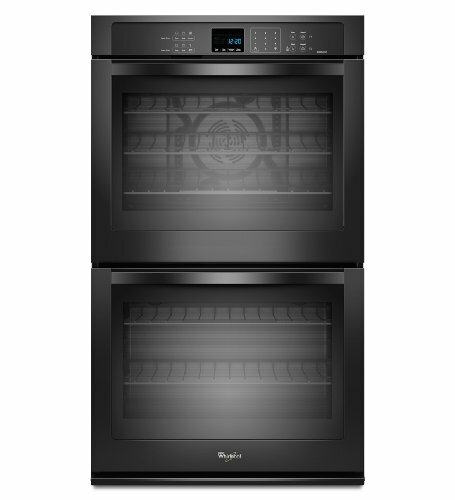 If you're looking for the best electric oven, the Whirlpool double oven is a good option. The self-clean function, 12-hour delay timer, and control locks are great features. It also has a warming function. This feature is great for times when one dish takes longer than others. The recipe that you complete first will remain warm until the rest of the meal is ready. 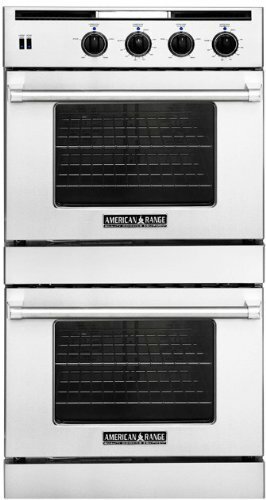 For homeowners looking for the best gas 24-inch double wall oven, the American Range double glass oven is our pick. It features heavy-duty racks. It also has a broil element for browning. This product also features the porcelain interior, that can withstand high heat levels. Plus, the convection heat helps decrease prep and cook times. 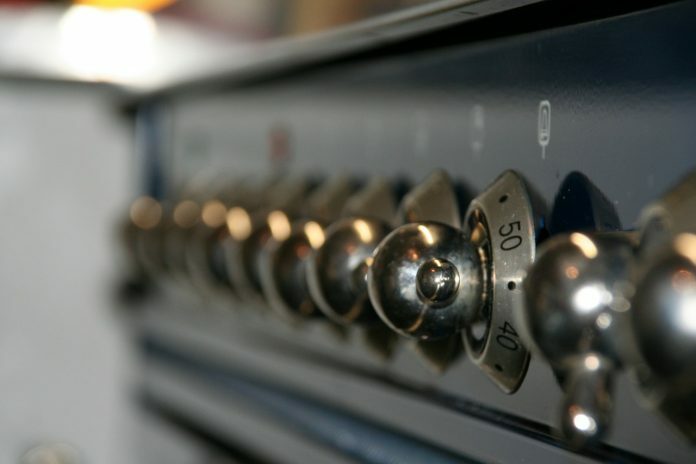 Do you own any of the ovens on this list? Let us know your experience! Previous articleThe History of Ovens: How Have They Evolved Through Time?